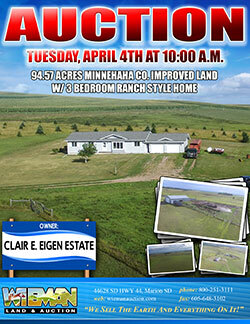 In order to settle the Wilhelmina Jorgensen Estate, we will sell the following land at auction at the Wieman Auction Facility at 44628 SD Hwy 44, Marion SD, located 1 south and ½ west of Marion SD. Legal: The SW ¼ except the South 16 rods of the East 25 rods and except Lot 1 of Jorgensen’s Addition in Section 29-97-52, Turner County, South Dakota. 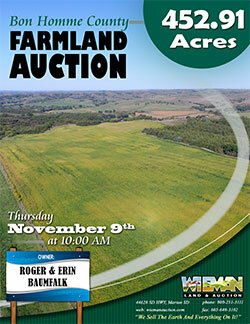 We will sell the following farmland at auction on the land located from Avon SD, 10 South and 2 ¾ West. Legal: Lot 1 of the NE ¼ less that part lying south of Highway Right of Way Section 23-93-62 and the N ½ of the NW ¼ less that part lying south of Highway Right of Way Section 24-93-63 and Lots 4 & 5 in the SW ¼ of Section 13-93-62 and Lot 1 of SE ¼ of Section 14-93-62 all in Bon Homme County South Dakota. 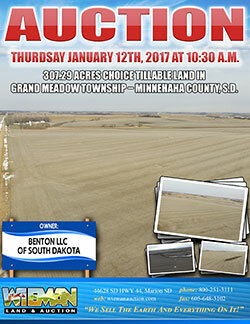 We have decided to sell the following land at Public Auction located at the Wieman Auction Facility located from Marion, SD 1-mile south and ½ mile west. 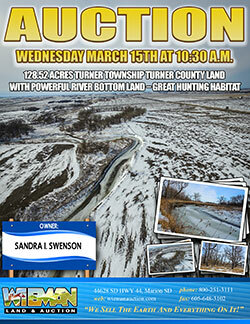 LEGAL: The W ½ of the S ½ of the NE ¼ and the W ½ of the E ½ of the S ½ of the NE ¼ and Tract 4 of Rundell’s Add all in Section 4, 98-53 Turner County, SD. LEGAL: Tract 2 & 3 of Rundell’s Add. In Section 3 & 4 98-53 Turner County, SD. 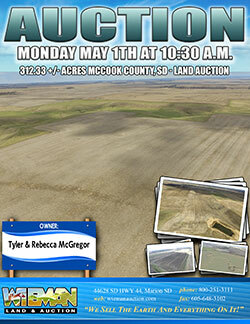 LEGAL: The SW ¼ SW ¼ in Section 36-100N-58W, Hutchinson County, SD. 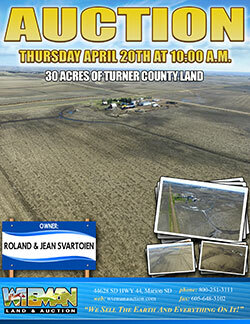 In order to settle the Trust, we will offer the following land for sale at public auction located in the American Legion Wagner, SD. LEGAL: SE ¼ of the SE ¼ of Section 25, 95-64 Charles Mix County, South Dakota. LEGAL: The S ½ of the NE ¼ of Section 25, 95-64 Charles Mix County, South Dakota. LEGAL: The NW ¼ except Lot J-1 in the NE ¼ of the NW ¼ and Lot C-1 in the NE ¼. Except Lot K-1 in the NW ¼ of the NW ¼ in the NE ¼ of the NW ¼ and in the SW ¼ of the NE ¼; all in Section 9, 95-63 Charles Mix County, South Dakota. 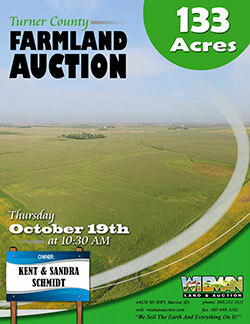 As we have purchased another property and are completing a 1031 exchange, we will offer the following property for sale at public auction located in the Wieman Auction Facility located 1-mile south a ½ west of Marion, SD. LEGAL: S ½ of the NW ¼ except the W 586’ of the S 372’ in the S ½ of the S ½ and the NE ¼ of the SW ¼ all in Section 16, 99-54 Turner County, South Dakota. 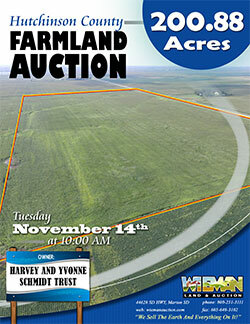 We have decided to sell the following land at public auction located in the Canova Legion Hall. The NW ¼ of Section 12, 105-57 Miner County, South Dakota. 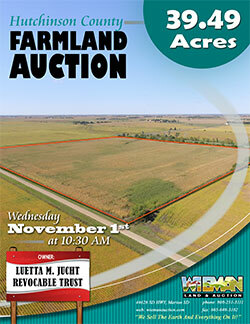 Auction to be conducted at the Lesterville Community Center, located 1 Block north of the elevator in Lesterville, SD. 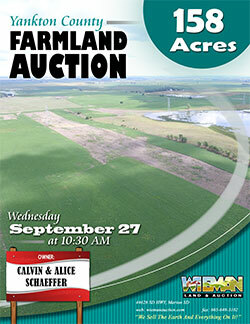 As we have moved to Hartford, we will sell the farm at auction at 25735 - 456th Avenue, located from Humboldt SD, I-90 Exit, go ¾ miles North on 456th Ave. 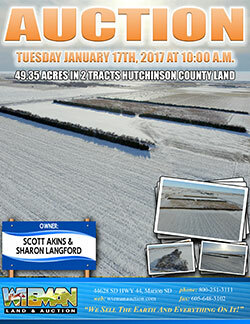 The McGregors are discontinuing their farm operation and it is our pleasure to offer this balanced agricultural property at auction! This property represents a nice opportunity to buy well-located, easily accessed property all in close proximity to each other. 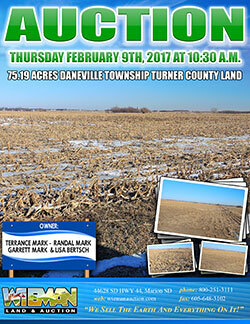 Offered in three individual tracts, the property is a nice blend of tillable land and pasture acres and will appeal to many buyers from farmers, livestock producers, investors and outdoor enthusiasts. Come prepared to buy! 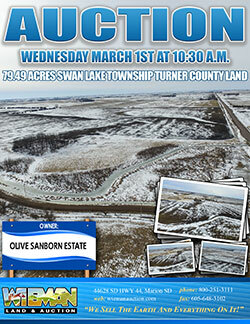 Remember...Only at Auction! 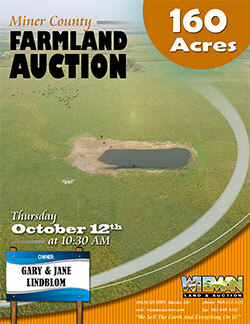 In order to settle the estate, we will offer the following land for sale at public auction in the Scotland City Hall. 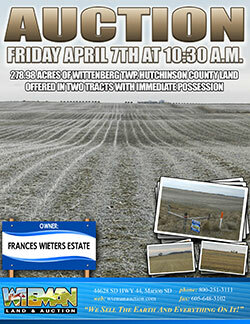 LEGAL: The S ½ of the NW ¼ and the NW ¼ of the NW ¼ of Section 16, 98-58 Hutchinson County, SD. LEGAL: The SW ¼ of Section 5, 98-58 Hutchinson County, South Dakota. 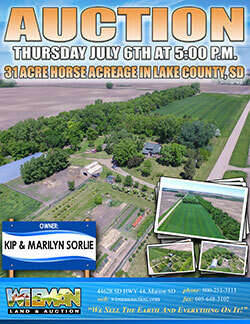 In order to settle the estate, we will offer the following land for sale at public auction in the Wieman Auction Facility located from Marion, SD 1-mile south and ½ mile west on Hwy. 44. LEGAL: The N ½ of the SE ¼ except the S ½ of the SE ¼ of the NE ¼ of the SE ¼ of Section 36, 101-57 Hanson County, South Dakota. LEGAL: The N ½ of the SW ¼ of Section 31, 101-56 McCook County, South Dakota. 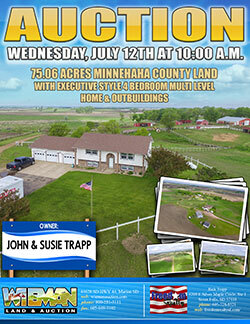 I have decided to offer the following real estate for sale by public auction located at the Wieman Auction Facility located 1-mile south and a ½ mile west of Marion, SD on Hwy. 44. The W ½ of the NE ¼ and the E ½ of the NW ¼ except Tracts 1 & 2 of Swenson Add all in Section 10, 97-52 Turner County, South Dakota. 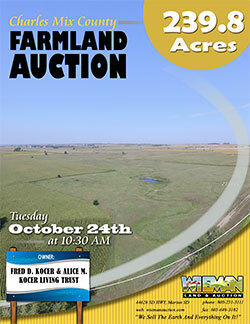 In order to settle the estate I will offer the following land at ABSOLUTE auction to be held at the Wieman Auction Facility located 1-mile south and ½ mile west of Marion, SD on Hwy. 44. 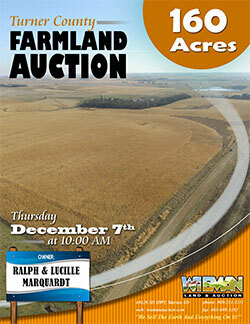 Our family has decided to offer the following land for sale at public auction at the Wieman Auction Facility located from Marion, SD 1-mile south and a ½ mile on Hwy. 44. 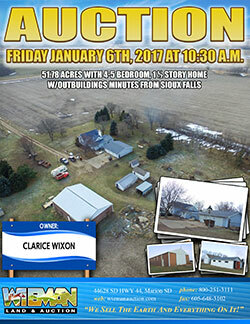 LEGAL: The W ½ of the SE ¼ of Section 10, 96-53 Turner County, South Dakota except the South 465’ of the West 450’ thereof. 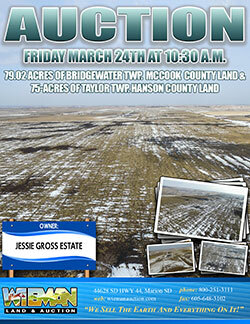 307.29 ACRES CHOICE TILLABLE LAND IN GRAND MEADOW TOWNSHIP – MINNEHAHA COUNTY, S.D. 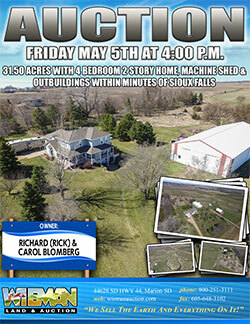 To be held at the Crooks Community Center at 701 S. West Avenue, Crooks, SD. Located from Lyons, SD go ½ mile North then 1 ½ miles West on Highway 118 (252 Street) or at the JCT of 252nd Street and 465th Avenue; or from Tri Valley school go ½ mile East (North side of the road); from Colton, SD go 3 ½ miles South on 464th Avenue then 1 mile East on 252nd Street (North side of Road). 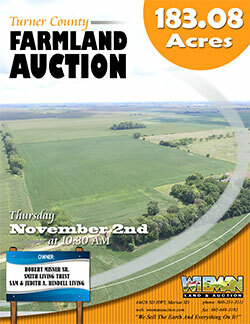 Wieman Land & Auction Co., Inc. is a third generation family company that was start by Earl Wieman in 1949. 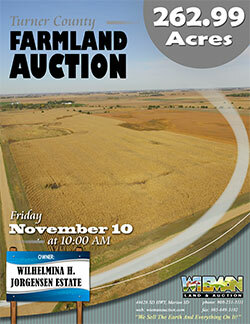 Wieman Auction has grown over the past 60 years but one thing is still the same. We offer fair, honest, and courteous treatment to everyone. Whether it is buying or selling your land, home, farm, business, farm equipment, or other personal property, we are here to make that process a little bit easier. There is no job too big or too small, so give us a call and we would be happy to work with you.